Australian Feral Pigeon Control & Removal. 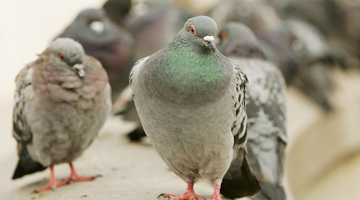 Australian Feral Management uses an array of proven methods to control pigeons in all situations. We can carry out an eradication program with discretion, our own patented Pest-X bird spikes were developed in house over 25 years ago and are still effectively repelling pigeons today. Our designed pigeon traps are used by professionals throughout Australia. With sophisticated sound suppressed air rifles we can rid a factory of hundreds of pigeons in one night. Where pigeon baiting is going to be employed a permit is required from the National Parks & Wildlife Service. Sometime prevention in the form of barriers can be employed to prevent pigeons gaining access to work and pedestrian areas. We are quite happy to advise on the appropriate method to control these unwanted birds. Types of Pigeons – Feral and Pest. Doves (pigeons) are unique from other birds as they drink by sucking, so they don’t have to tilt their heads back to swallow. People should be aware that pigeons have been associated with diseases such as lung, heart and kidney disease, salmonella and respiratory problems to name just a few. A work place free of pigeons and their faecal material will make for a healthier work environment.